Casual, comfortable and handcrafted to impress, the Amish Outpost Barstools invite family and guests to sit and stay awhile. These wood barstools are available in 24" or 30" height to provide seating at your kitchen counter, bar or gathering table. Pub height bar stools are a great option for creating a casual dining atmosphere and their added height creates the illusion of added space in the room. 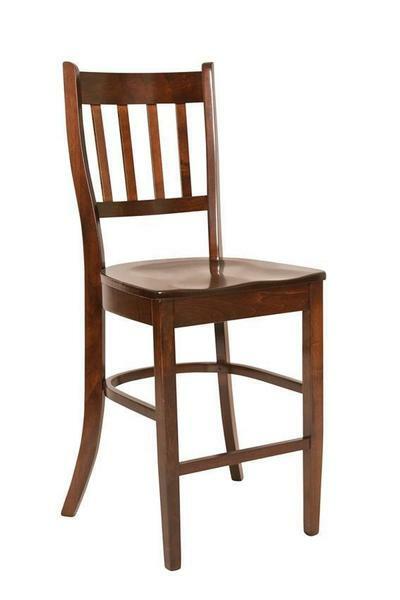 The Amish Outpost Barstools are from the Hillview Chair Collection that's handcrafted by the Amish in Ohio. All chairs in this collection are wedged, glued and screwed together for optimal strength and stability. We can't wait for your new barstools to be on their way to you to become part of your family kitchen. Click on custom options easily or for more personal service, please call or email and a Furniture Specialist will be happy to assist you.